Miss Bates isn’t keen on closed bedroom-door romances, kisses-only yes, but not closed door. Why you say? The genre’s beauty lies in the reader’s access to every aspect of a couple’s relationship. The closed-bedroom door turns one important relationship-facet away from the reader; whereas, kisses-only doesn’t. But there are category writers who like their bedroom doors closed and Miss Bates concedes to them because they deliver in other ways. Jessica Hart is one; Liz Fielding, another; maybe Jackie Braun; some early Soraya Lane; and Barbara Wallace, after she proved wondrous in one of Miss Bates’ favourite category romances, The Heart Of A Hero. As a result, she was most eager to read Wallace’s latest, A Millionaire For Cinderella. Set on Boston’s moneyed Beacon Hill, it’s the story of housekeeper Patience Rush and wealthy attorney Stuart Duchenko. Patience takes care of Stuart’s beloved Great-Aunt Ana and they both cater to cat Nigel. Stuart’s arrival to find Patience ensconced at the Beacon Hill brownstone and even “writing checks,” brings out the lawyering suspicion in him, despite the attraction he feels for her Venus-bod. As the vulnerable and pretty Patience notes when she first sees him in the ER where she awaits news after Ana’s fall, Stuart Duchenko is “predatory,” with a “killer instinct.” His suspicions prove correct when revelations about Patience’s past put her in an entirely different light from fresh-faced and competent care-giver, painful, hurtful revelations that should urge Stuart to stay far, far away – instead he grows to like and admire Patience. Wallace’s A Millionaire For Cinderella is a valiant attempt at contemporary cross-class romance. There is definitely a “gap” between housekeeper Patience and lawyer Stuart; note Patience pondering their disparate statuses: “The two of them came from two different worlds. Rich versus poor. Clean versus dirty. Sitting here, sharing childhood losses, it was easy for that fact to slip her mind.” Therein was Miss Bates’ problem with Wallace’s romance. Yes, Patience isn’t wealthy, or educated, but “clean versus dirty”! We learn, not too spoilerish here, early in the romance, that Patience, to help her sister and keep food on the table after their mother died, worked as a stripper. Her shame and self-abasement are laid as thick as peanut butter on bread. If this is the character Wallace choose to write, then Miss Bates has to take her at face value: this is how she feels and that’s that. But it sure does grate. There are hints of Patience’s self-condemnation even before Stuart’s arrival, as Patience considers what Ana did for her: “she’d rescued Patience, taking her from the dark and dirty and bringing her into a place that was bright and clean.” It might very well be that a person/character may find the experience of working as a stripper degrading, but the inherent judgment in Patience’s reactions to what she did to survive were problematic for Miss Bates. When Stuart and Patience attend a society dinner to pick up an award on Ana’s behalf, Patience is mauled by a drunk old man. She blames her dress and body for what happened: “Her scarf had been pushed aside during her scuffle with Dr. Tischel, revealing her ample cleavage for all the world to see. No wonder the good doctor had hit on her. She looked like a two-bit whore.” Never once does Patience (and her name says it all allegorically, doesn’t it?) raise that chin and say she didn’t enjoy stripping, wished it was otherwise, but she, dammit, did what she had to do to survive and take care of her sister. When she breaks down and tells Stuart about her upbringing by a negligent mother and struggles to survive after her mother’s death with Piper in tow, Miss Bates was moved. But the return to self-abasement, the stuck-needle quality of Patience’s shame didn’t show any growth. Here’s Patience after she tells Stuart her story, after a night when he danced with her and treated her like she’s always wanted to be treated by a man: “For a while she’d felt like Cinderella at the ball. But it was time to come back to reality. Having told her story, there was no way Stuart would ever look at her the same way again. How could he? She was no longer a housekeeper; she was a housekeeper who used to take her clothes off for money.” Her sin of being a housekeeper is compounded by “stripping for money.” Her self-worth is of value only when others, like Ana and Stuart, see her in a good light. Except she knows that they do so under the pretense she’s a lowly, but honest, and … yikes! … “clean” housekeeper. The stripping, on the other hand, puts her in the moral pale. While Patience’s validation comes from Ana and Stuart, Stuart’s attitude towards her is priggish, if not piggish. He shields Patience from other men’s eyes (and you’d think the entire world were made up solely of leering lecherous types), even while he lusts for her himself. But he’s a humble dude, having suffering childhood trauma, such as wearing glasses and having asthma. Poor fella. And his girlfriend dumped him for … too spoilerish, but it IS ludicrous. He’s been hurt. He works too much. And he doesn’t have friends. How could an ex-stripper’s, now-housekeeper’s heart resist his poor little rich boy self? When a night-walk sees Patience and Stuart running across a drunk stripper from Patience’s club, Feathers, his response, when “Chablis” recognizes Patience, is” “A sick feeling hit him in his stomach. ‘She’s got you confused with someone else, right?’ … ‘It’s true, isn’t it? he asked. ‘You were a – a … ‘ … ‘You’re not even going to try and explain yourself?’ Patience had never felt more dirty and exposed as she did under his stare, … ” When further revelations come out about Patience, Stuart is enraged, slamming the front door open, approaching Patience “waving the papers in his fist like they were a club.” He claims he’s hurt by Patience withholding her past from him, not what she did for a living. Maybe. But at this point, Miss Bates didn’t like either of these characters. Patience needed some spine and Stuart needed to put a sock in it. 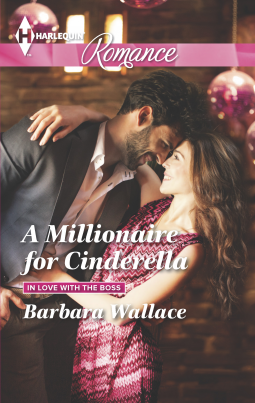 Barbara Wallace’s A Millionaire For Cinderella, published by Harlequin (Romance), was released on June 2nd and is available at your preferred vendors. Miss Bates received an e-ARC from Harlequin, via Netgalley. Do you have Sarah Mayberry’s Bound to the Bachelor? I didn’t love it, but the heroine’s stripper past is much less objectionable. I don’t, but that sounds right much better … because Mayberry more nuanced sense of these things. Thank you!